Modern Sounds in Country and Western Music | A Continuous Lean. 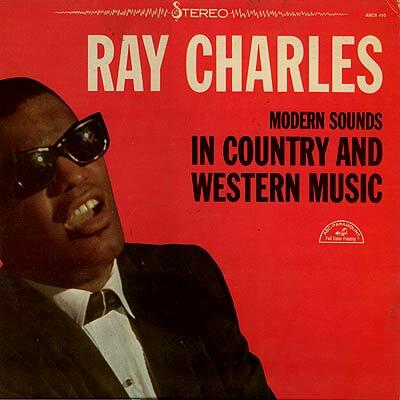 Does it really get more American than Ray Charles Modern Sounds in Country and Western Music? Released in 1962 amid the civil rights struggle, the album blends musical styles and got heavy play on both R&B and Country radio. Think about that, R&B and Country are two very different groups of people. Frank Sinatra called Ray Charles “the only true genius in the business,” and I wouldn’t disagree. In producing the album, Ray Charles became the first black artist to demand and get complete artistic control over his music, which would be no small feat today let alone in 1962. Modern Sounds in Country Western gets a lot of play in my life and spans moods like very few can. If you don’t know it, hear it. If you don’t own it, buy it. If you buy it, you will love it. Ray Charles playing over the loudspeaker at an old job I used to hate was the only thing that got me through it. Thanks for point us to this album. Fantastic. TouchÃ¨. And the vinyl…even better. I’ve been reading your blog for a while but it’s the first time I’m commenting. I have to say your American obsession is starting to make me a bit uncomfortable. Talk about Ray Charles, who’s obviously great; talk about all the things you like (which I’m most of the time aesthetically fond of), and all the beauty you see. But stop narrowing everything down to it being American. Sebastian â€” America is sort of the framework of ACL, the lines I operate between. Don’t get it twisted. Michael, I totally get that. And I appreciate your unique voice and all the effort you put in this blog. I just think it’s important to always stay mindful when becoming patriotic. To me there’s a big difference between “It’s American” and “IT’S AMERICAN!! !” That said, I don’t think this blog spells America in all capitals… and I’d hate for it to go down that slope. I actually just bought this and vol II on vinyl last weekend. Perfection. When people disparage country music, and don’t recognize that it’s one of the two deep roots of rock ‘n’ roll, I point them to this album, and its successor, and say, “Ray got it, why can’t you”? Sebastian â€” Hopefully ACL will be AMERICA in NEON ALL CAPS someday soon! Kidding. I hear you, thanks for the feedback. Amazing. I’m adding this to my wish list of albums to buy. It would be double cool if I can find the LP. The first night that I stayed in my first apartment on 9th and Aurora in Boulder, amid a mess of boxes and crap, i took out my record player, set up the speakers and put this record on and listened to it until I fell asleep on the floor. Will always remember that. Love love love this record. goddamn this sounds good. been a long time. I had no idea. I knew a bit about Ray Charles but had no idea about this album and it’s appeal to very different musical tastes. Was it intentional given the current social problems of the time? May I also commend to your attention Charley Pride. See, this is the kind of crap that drives me up a wall. Do people come to your house as guests and tell you how to behave in your own home? Of course not. So where do you get your balls big enough to tell someone how to frame their posts on their own blog? If you’re so uncomfortable and your sensibilities are so fragile then take a ball four. Either enjoy the post or don’t but don’t feel the need to come around playing Jiminy Cricket. That guy Sebastian oughta pipe down and read the entirety of this blog to get a whiff of the angle here. That is to say this entire site is devoted to the many great American-made products of the past and the dwindling number of those things in the present. For instance, the most American piece of clothing I can think of is a pair of 501s and they are no longer made here. A good post would be talking to someone who knows a thing or two about old American-made Levi’s and maybe putting up a few pictures. Alas, this post already exists! I wonder what gave him the impression that advising the creator of one of the best blogs on the internet to neglect the foundation (no pun intended) of it was a good idea. Foundation originally said fabric. I scrapped that part but forgot to remove the parentheses, etc. Rats. Chalk it up to the heat of the moment. Patrick, I’m not telling Michael how to behave in his house. I’m commenting on a blog that is more than anything a piece of journalism, ‘published’ on the Internet for many to read. I’m sorry that it’s against your sensibilities to read anything else than “Love it!”. I hope that someone agrees with me that an appreciation for the First Amendment is even more patriotic than for a pair of jeans. PS: Michael, don’t get me wrong. I love Jeans – so pls keep writing about them! I love good jeans, and I love good music. Keep it coming. I think Sebastian made a really good point – you guys need to relax and stop getting so huffy when anyone says something that even remotely disagrees with ACL. ACL has every right to frame his posts however he wants – it is his blog after all. But I think Sebastian made the very rational point that this is a form of journalism presented to the public and people can react and respond accordingly. ACL – keep doing your thing and follow your vision and the rest of you guys chill out and stop jumping down people’s throats for having an opinion. Nice call, Michael. Along with Elvis Costello’s “Almost Blue” and the first Knitters album, Ray’s “Modern Sounds In Country And Western” is one of the all-time great gateway albums for nudging folks who think they don’t like country into reconsidering that bias. I don’t think anyone is trying to deny any First Amendment rights here, but I do think there’s some merit to saying it’s wrong to criticize someone for the core of their blog. Journalism, blogging, and column-writing, are all similar animals driven by opinion and it is everyone’s right to disagree but saying someone should tone down the American focus on a blog about American things seems backwards to me. As always Michael, great stuff and I’ve been noticing some posts from you at men.style too. The more from you the better I say. The first amendment is inapplicable in this instance. The first amendment prohibits the U.S. Congress from creating laws that inhibit free speech. The amendment has been interpreted to encompass slander and libel, neither of which have happened here. Perhaps the American thing to do would be to actually read the Constitution and the Bill of Rights to understand the difference between a government inhibiting free speech and an individual’s choice to be civil – or not – with regard to something another individual has said. I, like many another middleaged redneck, grew up with these two fine albums. I was an adult before I realized that Ray Charles was anything other than a great country singer. I’m okay with Jiminy Cricket. Any suggestions where I can get my hands on a blue top hat? American made only please. “The first amendment is inapplicable in this instance. The first amendment prohibits the U.S. Congress from creating laws that inhibit free speech. In the words of Michael Scott – boom roasted. Ray was a legend. Great post! Saw Ray Charles at GWU’s parents weekend right before he passed away. It happened to be my birthday and to hear his classic “Georgia on My Mind” made my day. For him to pass shortly after, amplified how amazing that evening was. My parents owned this album, I grew up with it! Thanks, Michael. Ray Charles was an American classic; sadly, he was a moral mess, with multiple mistresses and a one-time heroin addiction. So I don’t take him as a role model and enjoy what he was good at: music. Note to Sebastian: Love of, and pride in, one’s country is the natural state of affairs. It’s only the liberal/leftist insanity of the past 40 years or so that has deceived so many people into believing otherwise.